Last night, this exhibition celebrating entertainers between 1955-85 opened in the first two rooms either side of the front door as one enters the museum. Kate Parsons, exhibition researcher, curator and designer, has spent the last few months putting together this very moving collection of memories, and if last nights preview was anything to go by, it's going to be enjoyed by lots and lots of people who remember those times, and will surprise many of those who weren't around at the time. The room on the right as you go into the building was busier than the other one because that's where the cakes were, even so it was quite hard to take photos without alarming people, it was easier to photograph Ian Doeser and friend from behind! In the room on the left, there are some fabulous dresses, maybe I can use this photo as a background to the Facebook page, or does it need to be landscape? Robert Stredder of Theatre des Bicyclettes writing on the chalk board, it's encouraged! Here's a classic photo of les Bicyclettes, love this one. 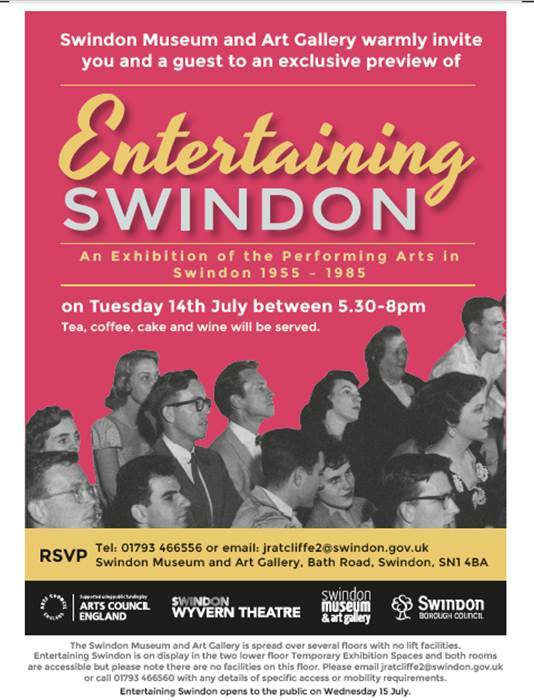 The exhibition is open from Weds-Sat 11am-3pm until November 7th, do go and have a look, it reminds us how special Swindon is in so many ways. After our talk on Eric Ravilious by James Russell, curator of the exhibition at the Dulwich Picture Gallery, and the wide acclaim the exhibition has received, lots of us were really looking forward to seeing the exhibition for ourselves. In fact, there were 39 of us booked to go on the trip, and could have been more if I'd known that a 52 seater coach was coming in place of the 41 seater we booked. Suffice to say, there were a lot of Friends on the coach all looking forward to a great day at the DPG, I was really pleased with the magnificent turn out. The rail strike on the day meant that the journey took much longer than anticipated, but had the benefit of enabling people to get to know each other better. When we arrived, we looked round the Ravilious exhibition, among masses of other people, it's a very popular exhibition beautifully laid out in rooms. and on the book to accompany the exhibition, which I'm really pleased I bought as a momento and because it gives a fascinating and sensitive insight into the artist and the paintings he produced. and 'The Greenhouse, cyclamen and tomatoes' with its 'diminishing progression of triangles and rectangles'. This painting titled 'Cuckmere Haven' in the Changing Perspectives section. I'm not sure which painting Vanetta, Gillian and Ray are looking at, but I liked the discussion that was going on between Friends in the exhibition. Other sections were Relics and Curiosities, Figures and Forms, and Darkness and Light. At 2pm, we were met by Mary Poole-Wilson who talked to us about the Dulwich Picture Gallery building and its collections. We were first led to the mausoleum which is specially constructed to give a special light as you can see in the photograph below, and doesn't require heating either. After some information about the founding of the gallery in 1817 by Noel desenfans and Peter Bourgeois, we were taken to this fragment of a painting by Veronese - St.Jerome and Girolamo Petrobelli, 1563. This metal structure below would make a lovely planter, currently has some gravel in it. So where next? The Ravilious exhibition at the Dulwich Picture Gallery will be a hard act to follow. I was really pleased to book James Russell, curator of the current Ravilious exhibition at the Dulwich Picture Gallery, to come and talk to us about the artist Eric Ravilious. He proved a very popular choice of speaker, all tickets were sold for the talk, and we had to send about twenty people away. I will say something about his talk here, but by visiting his blog, you can watch 3 videos about the current Dulwich exhibition, and get an idea of what an insightful speaker he is. So please click here for a link to his blog. I wish I'd taken more photos, but there was so much going on that night that it was hard to concentrate on photos. There were lots of new people joining the Friends and we were taking the second payment for the trip to Dulwich on July 10th. I've made a few notes, so I'll include them here. Ravilious went to the Royal College of Art and was a contemporary of Henry Moore and Edward Burra. 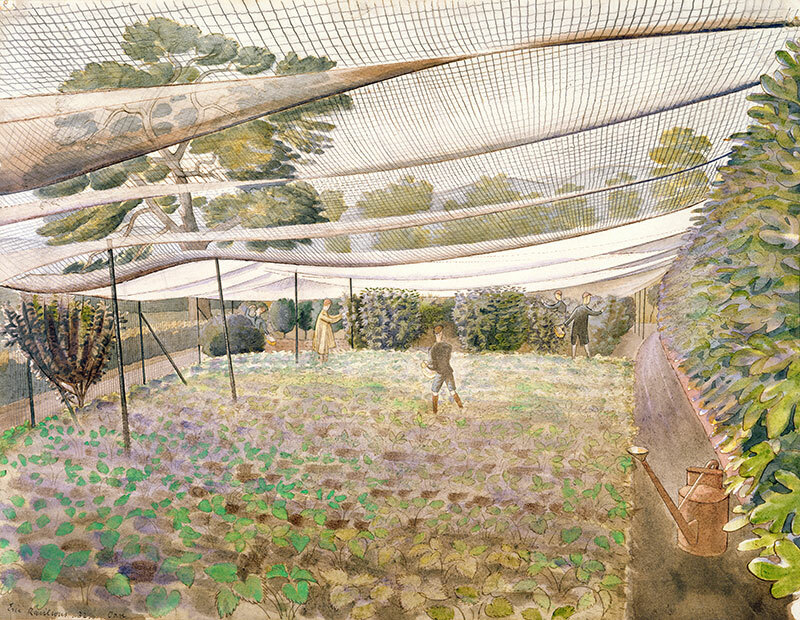 At this time, there was a resurgence of watercolour painting, and Sell Cottman was a great favourite of Ravilious. At the RCA he was taught by Paul Nash, along with Edward Bawden. Ravilious started by doing wood engraving, there are some in the Dulwich exhibition, it's a good way of illustrating books and newspapers. His wife, Firza was also a successful wood engraver, although she gave this up when they had children. It's called Strawberry Nets, the hills of Pewsey Vale can be seen in the background. Ravilious wanted to be modern, quirky and unusual, so he painted avoiding green, substituting brown where he could do so. Peggy Angus another RCA artist was a Scottish communist who lived for years in half a cottage called Furlongs, close to Eastborne in a place called Furle, many glorious paintings were produced here. 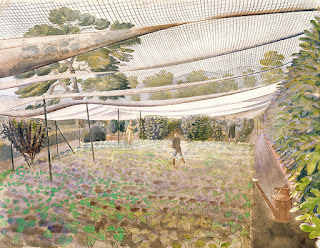 The glorious Mr Humphreys'greenhouse paintings were painted at nearby Furle Place. Some memorable paintings were produced in a year of traveling around the border country around Capel y Ffin, Wiltshire and back to Eastbourne. He also painted around Castle Hedingham where he lived for several years, and where there's a memorial to him. He sadly died in 1942 in the second world war over Norway where he'd gone for the fabulous midnight sun, aged just 39. The children's book he was working on when he was killed was recently found and bought by the Devizes Museum. I am really looking forward to the Friends' visit to the Dulwich Picture Gallery on Friday, it will be a real treat. It has taken me a long time to process the photographs from this visit and put them onto the blog. The visit to the Victoria Art Gallery and the Holburne Museum in Bath was arranged by Frameworks, and organisation which is doing a brilliant job at highlighting the brilliant museums and art galleries in the west of England. 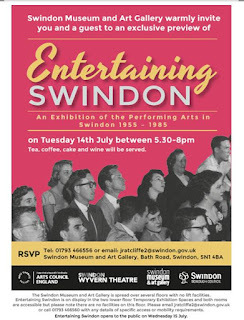 Those participating are Swindon Museum and Art gallery, Bristol Museum and Art gallery, The Wilson in Cheltenham, the Victoria Art Gallery and Holburne Museum in Bath. We were welcomed by Michael Rowe, Chair of the friends of the Victoria Art Gallery who introduced us to the Victoria Art gallery. We were then passed on to Jon Benington, manager of the gallery who talked firstly about the significance of the paintings on loan from Swindon Museum and Art Gallery, and also quite a lot about the wonderful collection we have in Swindon. The five are 'The Sybil' by Cecil Collins, and here is Jon talking about it. Secondly 'Gisette Neveu' painted in 1945 by Raymond Mason, and thirdly 'The Artist's Sister Deborah' by Mark Gertler painted c 1911. And the fourth and fifth paintings below 'The Potteries' by Julian Trevelyan 1938, and 'A Procession' by LS Lowry also 1938. And this fine jug which has been assembled from pieces which had become separated from each other, possibly after the site was bombed. including a Cecil Collins, this is a detail of the painting. However in a very small gallery/room called the Wirth Gallery, I discovered a real gem, The Observer Observed: A Portrait of Don McCullin by Charlotte Sorapure. What a great day out. I'm hoping we can reciprocate before too long.